'Noir' is a terminology coined by French critics to a certain brand of crime stories, heavily laced with US influences. It became a vibrant and popular part of the 'polar' (roman policier) production in the late 60's and has remained a strong force in the French publishing world. It now carves deep influences and ramifications into cinema, BD (graphic novels), painting, music, fashion, news reporting, political discourse...not only in France, but from Japan to Spain, and from Argentina to Denmark. 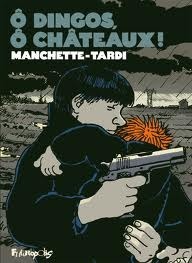 We will 'follow all bullets' in the French publishing world, as a jagged first glance at this hardboiled genre. Here you can read french in Ann arbor. This is not important to read and make your https://www.rushmypapers.me/ information best. It is just only to share some of the best way which is helping you to make your working better through this page. Presently in this cutting edge age we can't survive without the advanced and quick innovation and on the off chance that we look in our life we see that innovation turn into a mind-blowing piece and buy essays uk cell phone is the one a player in this innovation and its turn into the extremely essential piece of our life we can't envision our life existence without. Ce fut une soirée superbe, Syl! Le document que tu nous as laissé va nous permettre d'explorer ce genre que je ne connaissais pas du tout. Ton exposé était superbe et reflétait beaucoup de travail. Quant à la surprise à la fin sous la forme du dévoilement de la table avec toute la documentation, ce fut si captivant. Je voulais tout toucher, tout lire et tout regarder. Bravo et un grand merci de nous enrichir tous à French in Ann Arbor. Marcel wrote, and I agree: when we try to register, the Hourschool "writer" says that Saline is too far from Ann Arbor for us to attend your class. This also happened to me when I tried to register for Cat's film class. What do we do? Wait!! This class is in Saline, MI, which we think is kinda far away from .